I really want to thank all of you for your comments on my previous post; I know the enticement of a giveaway is strong, and I love it when so many folks come out of the woodwork to say hello! If you haven’t done so already, I really recommend going back and reading through the comments, to see what people find exciting about their knitting. I am inclined to agree with a lot of it – there is so much to learn and continue to be challenged by, and there is a lot of pleasure in seeing your completed works unfold in front of you when, just a short time earlier all you had was a few balls of yarn. 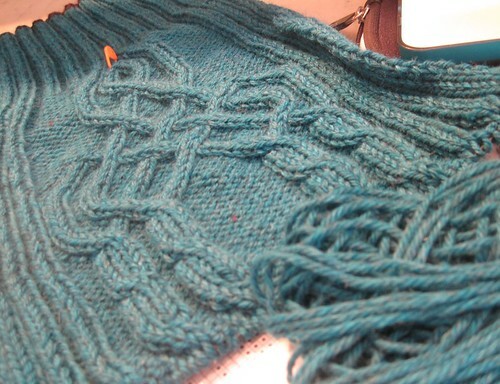 I am working on this in Cascade 220, in a lovely teal blue heather that I found on sale earlier this summer. I like getting the sleeves of a sweater finished first if I can help it, because that makes the body feel much more satisfying to know that it’s almost the end. It’s great to be working from yarn before it has the chance to become hidden too deeply in the stash, and I look forward to wearing the final product this fall. But to close up the full content of the last blog post, I’m happy to report the winner of the blog giveaway! The random number generator came up with 75, which by my reckoning corresponds to commenter “stargirl” on September 11th. I’ve sent her an email and will be sure to get the kit off in the mail soon. Thank you all so, so much for your comments, and I’m sure I’ll do another giveaway again sometime soon! Have a great Tuesday knit tonight, wherever you may be. I’m working on the fronts of a cardigan, and lately I’ve just been powering through during TV, too! Oh my goodness – that is coming out beautifully! I can’t wait to watch it grow. What a beautiful sweater! I love that color. Lovely cables and I especially love the yarn colour. Its gonna be a pretty sweater. A winter coat is joining me on countless episodes of “Say yes to the dress”! The cables in your sweater are wonderful! While I nurse a sore shoulder and thumb joint I’m dabbling with toes up socks. They are fun, but i can’t work very long at a time. sigh. Wow, you got 160 comments on your last post! Giveaway or no, that means you have a lot of readers. You’re a rock star. And that cardigan is looking absolutely fantabulous. Can’t wait to see it finished and modeled. (apart from the fact that it will increase the length of my never-ending-queue and I don’t have time to knit etc etc. The usual refrain). I have never thought of doing the sleeve’s first. What an epiphany moment that was when I was reading it! First off, I love Castle, second, I hate doing sleeves. I can’t tell you how many sweaters that I have half finished with one sleeve done! I won’t loose momentum if I do the sleeves first because I’m always hipped when I start a project so it really doesn’t matter that it’s a sleeve. Thank you so much you have renewed my motivation to knit sweaters again. I’m working on my second sweater by designer Heidi Kirmaier–both worked from the top down–but when you get to the sleeves, instead of looping them off and continuing with the body–you do each sleeve. Now that was an “ah’ha” moment–so when you are done with the body–you are DONE! Two sleeves–sort of like the second sock syndrome, I guess. Just not fun. Get them out of the way!!! YES! Your cabled sweater is a real beauty!!!!!!! I am in love with those cables in that color! You do beautiful work. Knitting and TV go hand in hand as far as I’m concerned! Lovely cascade 220 colorway and kudos for getting so much done your sweater. Someone recently gave me the same advice when knitting sweaters — start with the sleeves first so you don’t feel fatigued. I couldn’t agree more. Congrats to stargirl. Is the color you are using a little tweedy? I love the cables on it, too. Cascade 220 is a fab yarn, great choice! It is a great idea to do the sleeves as you can potentially use them as take along projects. Sometimes I get both body and sleeve going to provide the flexibility of choosing which one I want to work on that day. Congrats to Stargirl…I hope you enjoy your new project! I am currently finishing the sleeves to Amanda from “A Fine Fleece”. This will be my third one…all of the other ones found new homes…hopefully this one stays with me! Your sweater looks great and I just love the color! 220 is my mainstay! If you watch TV while test knitting a design you intend to sell, can the DVDs be written off as a business expense? That is a seriously lovely sweater. Uh, sweater start. Whatever! The color is awesome, and those cables are just yummy. 🙂 Can’t wait to see the finished product!